My seven year old daughter is a huge fan of My Little Pony and treasures her collection of toys, books and movies. She was so excited to learn about the latest My Little Pony release from Shout! Factory Kids and Hasbro……the My Little Pony: Classic Movie Collection! Released on January 21st, 2014, My Little Pony: Classic Movie Collection includes two DVD discs and features four classic movies i.e. Princess Promenade, Runaway Rainbow, Dancing in the Clouds, and Friends Are Never Far Away. With themes such as valuing friendships and teamwork this is a wonderful movie collection for young girls (and boys too as even my youngest son enjoyed watching these movies). In these adventures My Little Pony favorite pony characters such as Wysteria, Pinkie Pie (Hannah’s beloved favorite), Rainbow Dash and Minty join their friend Spike the Dragon on exciting tales. From Ponyville’s fancy spring parade, a celebration of rainbows, the Friendship Ball and a party with new Pegasus friends, this DVD compilation features the best of the My Little Pony stories. My boys especially like Spike the Dragon who is a fun, silly and very sleepy 1,000 year old “not scary” dragon. Hannah loves the vivid colors of the gardens, flowers, rainbows and butterflies along with roller coasters and everyone’s favorite, ice cream. I have fond memories of My Little Pony which has been popular with children for thirty years. I even remember as a teenager watching my sweet young niece playing with her collection of over 100 My Little Pony dolls. This makes it even more enjoyable for me to watch these positive movies inspire my own young daughter’s imagination and creativity. This DVD collection has 2 ½ hours of My Little Pony action and these movies have been great to take along with us on those long road trips. 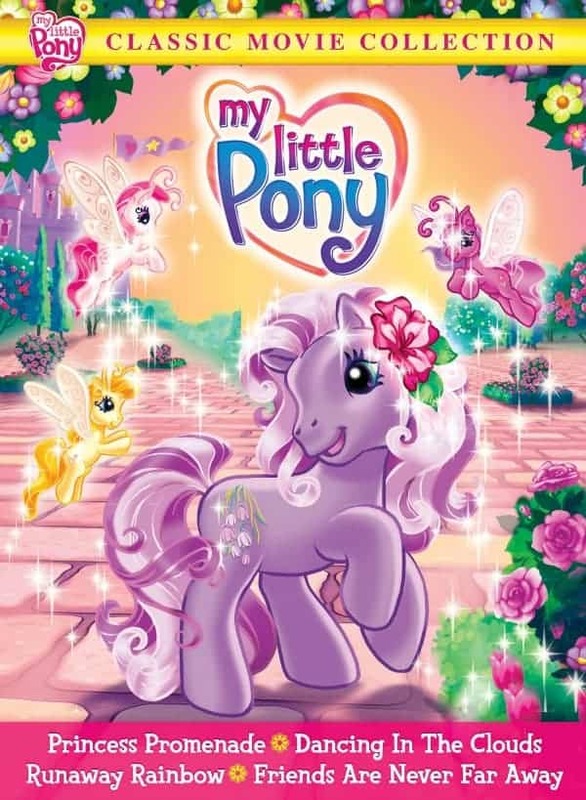 My Little Pony: Classic Movie Collection is a must-have addition to the home library of any My Little Pony fan. It is available for purchase at Shout! Factory for only $13.98 or at a selection of other retailers and online at Amazon.com too. fingers crossed for this one !